Charis Dewsbury in Yorkshire is located in the town of Dewsbury, West Yorkshire. Dewsbury is situated on the rail link between Manchester and Leeds, two of the largest cities in the UK. The railway station is only a 5 minute walk from the college. The motorway network is easily accessible within 5 miles of Charis Dewsbury in Yorkshire, with the M62 corridor going coast to coast, East to West and the M1 motorway going from North to South, Leeds to London. The very cosmopolitan city of Leeds is fifteen minutes away by train ( 10 miles), Huddersfield Town ten minutes away, both by a very good rail and frequent train service. 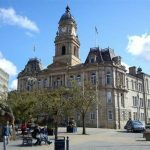 The town of Dewsbury is very well placed, with the National Parks of the Yorkshire Dales to the north, the Yorkshire Moors to the East and the Peak District to the South. The historical towns of York and Whitby are within the Yorkshire area. You can head off to Scarborough as well from here. The locals are super friendly and the mission field is white to harvest. Charis Dewsbury in Yorkshire is based in a fully refurbished building with an auditorium, classrooms, a Christian Radio station, and a refectory. There are a number of good local churches in relationship with the college in Dewsbury, Halifax, Harrogate & Honley. It opened to students for the first time in September 2011.